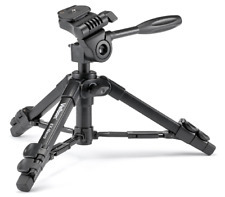 ★ Features: Transverse center column tripod; 180°foldable; monopod. ★ Stretchable hook,can hang other heavy objects to increase the stability of the tripod. ★ Locking material: Magnesium aluminum alloy. Maximum Tripod Load: 2.5kg. Sound & Vision. Screw Size: 1/4". 1x Phone Holder Adapter. With grip for adjusting the head position. Need Assistance?. Why Choose Us! Head type: 360?. Features: High quality aluminum material, light and convenience, Folded length 47cm, max height 140cm, Load capacity 2kg. Swivel fluid head. Double holder for optional ball head, more steady and your camera is safety. Not only its harder than the common one, but also its flexible handling, that makes your trip more enjoyable. Dual spirit level, three adjustment knobs design damping effect ball head, realizing any angle shooting, precise and efficient. 4-section column leg with quick release locks, giving a more convenient leg handling, satisfying your wanted height when shooting. Specification:. 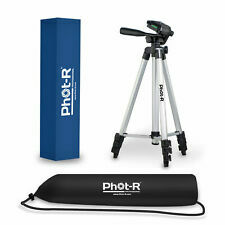 The Phot-R monopod reaches a maximum height of 171cm and a minimum height of 54cm. The aluminium monopod is lightweight, perfect for the travelling photographer, weighing only 362g. Cleaning & Care. 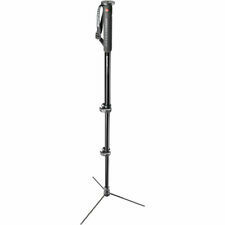 Fully extended, using the sliding centre column, the tripod can reach a maximum working height of 41.7cm. The 2-section legs have rubber feet which grip well on most surfaces. A carrying case is also included. Professional Aluminum Tripod Stand Holder For Digital Camera SLR Smart Phones Mobile Phones Genuine UK Seller, Brand New & Boxed, Full One Year Warranty Note: This tripod stand is compatible with all Digital/Video Cameras Camcorders including SLR and Mobile Smart Phones weighing up to 2.5kg. .
1 x Unipod Holder. The thread at the bottom of the monopod is: 3/8. 1 x Fluid Pan Head. The screw on the pan head: 1/4. The screw at the bottom of the pan head is: 3/8. Easy to travel with and use spontaneously. Great Quality Tripod. Maximum Tripod Load: 2.5kg. Screw Size: 1/4". With grip for adjusting the head position. Head type: 360 swivel fluid head. 360 horizontal and 90 vertical swivels with 3-way head. This is a table that compares with Weifeng 718,Nest-270 and Nest-777. Weifeng 718. This tripod is very heavy,about 5kg ,Freight is very expensive. 1 PC: Aluminum Tripod. Professional WF-718 Tripod Fluid Video Head Kit. Item features: Small size and lightweight, the closed length is 32cm only, one hand to carry on and max. height of tripod reaches up to 150cm Min. Maximum Tripod Load: 2.5kg. 1x Tripod Stand. With grip for adjusting the head position. Screw Size: 1/4". Head type: 360 degree swivel fluid head. 360 horizontal and 90 vertical swivels with 3-way head. Material: Magnesium Aluminum Alloy. Tube made of high quality magnesium aluminum alloy, can be folded 180 degrees reversely, easy to carry. Material: Aluminium. Material: Carbon Fibre. Head Type: Ball Head. 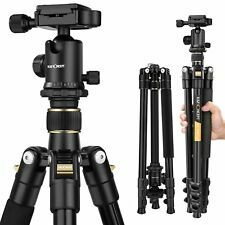 The Velbon M47 is part of the M-Series family of tripods, which feature a clean and simplified design. The M47 includes a 2-way fluid video head with quick release platform (QB-32). The legs are 4-section, with Quick-Lever locking for speedy extension and folding. This TSL08CN00 Slim Tripod from Benro is constructed from carbon fiber to minimize weight, supports up to 8.8 lb, and includes an Arca-type ball head with quick release plate. 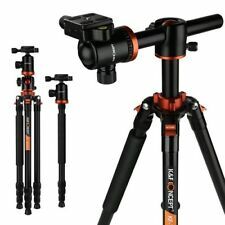 Together, the three legs can be extended and spread to raise the tripod from a minimum height of 15.7" to a maximum height of 48.4" or 57.6" with its push-and-pull, rapid center column fully raised. 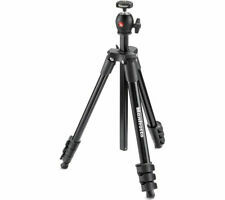 Manfrotto MKELES5CF-BH Element Carbon Fiber Small Traveler Tripod (Black). Condition is Used. Dispatched with Royal Mail 2nd Class. 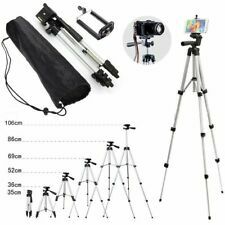 The tripod has a maximum height of 133cm and folds down to 500mm. There is a tilt and swivel head and a screw mount on the bottom of the center column. The flexible tripod is made from aluminium and nylon allowing the tripod to be resistant to corrosion, light weight but very strong and being able to withstand all conditions. The flexible tripod is able to bend and rotate 360° to form the perfect shape to provide the perfect stance and angle for long exposure shots. Material: Magnesium Aluminum Alloy. Tube made of high quality magnesium aluminum alloy, can be folded 180 degrees reversely, easy to carry. Material: Aluminium. Lowest angle shooting, macro shooting, and special photography can be achieved through inverted central axis. Condition is used however is still in excellent condition. Tiny scuff marks here and there. No head included but all legs work and is a handy tripod when you don't want to carry anything heavy. 2-in-1:Tripod converted to monopod by adjust center axis to satisfied different shooting idea. Transverse Center Column: Handle the central column from 0°to 180°in vertical and horizontal positions for different angle shots. 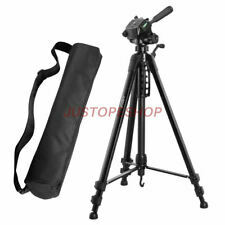 High Quality WT600 Tripod Dolly & Carry Bag. 1 X WT600 Tripod Dolly. Being able to move quickly can be the difference between getting a good shot and a great image. Each wheel has a quick and easy lock. Product Type: Tripod PTZ Set. Tripod section: 3 sections. This is a table that compares with Weifeng 718,Nest-270 and Nest-777. PTZ type: hydraulic head. Model: NT-777. Material: aluminum alloy. Weifeng 718. ✮ Tube made of high quality magnesium aluminum alloy, can be 180° reflexed, easy to carry. Why Choose Compact Tripod by K&F Concept KF-TM2235?. ✮ Material: Magnesium Aluminum Alloy. Aluminium Flip Lock. The Ravelli AVTP is a complete Professional 75mm Video Tripod including legs, mid-level spreader, dual fluid head and carry bag. There are independent locks for both the pan and tilt axis. It features a suction pad and a compact design that fits in every bag, which makes it a convenient accessory to bring along. • Independent Leg Spread: Yes. Head typePan & Tilt. Screw thread size1/4". Sirius 2500 Tripod only used once. No marks in very good condition. The quick release platform (QB-6RL) and a spirit level allow fast but accurate setup. Faulty Goods. The seal has been broken on any software or consumables. The goods were special order to your specification. Optex T-700 OptiFlow Camcorder Tripod. Heavy Duty. Optex T-700 heavy duty Camcorder tripod. Extends to approx 6 feet, folded 28". In near pristine condition. Boxed which is distressed. Velbon CX686 Tripod Heavy. In great condition. With Vel-Flo 9 PH-368. Pan and tilt fluid head. 3 section legs. Maximum Tripod Load: 2.5kg. Head type: 360° swivel fluid head. Rubber Leg Tip. With grip for adjusting head position. Screw Size: 1/4". 1x Phone Holder Adapter. 3 Way Pan Head with 4 Section Legs. I never use it . My friend give me. But i dont need it. 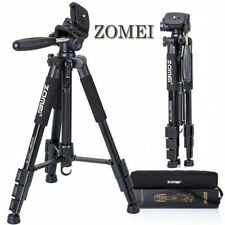 Zomei Q111 55" Pan Head Tripod Travel for Canon Nikon Sony Olympus DSLR Camera. Condition is New. Dispatched with Royal Mail 1st Class. Does not come boxes but in carry bag.